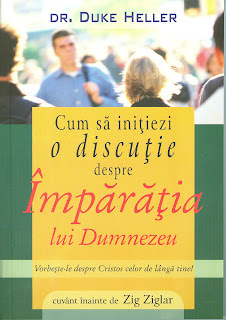 How to Start a Kingdom Conversation, a book on personal witnessing written by Dr. Duke Heller of Columbus, Ohio, and published by BMH Books of Winona Lake, Indiana, has just been released in Romanian, according to the Romanian Missionary Society (RMS) of Wheaton, Illinois. The book, which was written by the Columbus dentist to help those who wish to share Christ with those closest to them, is now in its third U.S. printing, as well. For more information on the Romanian Missionary Society, click here.